Posted on January 25, 2019 at 9:11 pm. There is no better indication that Boca Grande’s “high” season has arrived than the commencement of the seasonal Boca Grande Farmer’s Market. Technically known as the the Boca Grande “Farm & Fish Market”, the market is open every Friday beginning December 21st thru April 26th from 9 a.m. until 1 p.m. Conveniently located at the community ball fields at 305 Wheeler Street, visitors are encouraged to walk, bike or golf cart to maximize parking and minimize traffic. Market vendors can change from week to week, but you can always count on fresh produce, locally caught seafood, cheeses, seasonal flowers, an incredible guacamole station; as well as orchids, prepared foods, smoothies, organics, meats and much more. 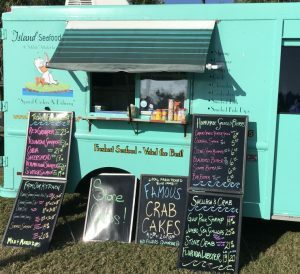 The seafood truck has only the freshest locally caught fish and typically offers grouper, crab cakes, snapper, cobia and triple tail if you are lucky! You can’t go wrong with any choice for an incredible gourmet meal. Make a Day or Weekend Out Of It! The Boca Grande Farmer’s Market is so special, you should plan a day or weekend around a visit. There are plenty of island accommodations for a quick weekend getaway, not to mention a wide variety of restaurants and shopping opportunities. Rent a bike or golf cart and see some of the island’s most noteworthy sites. Or simply take a small cooler with some or your recently purchased market goods and find a great spot for a picnic or sunset appetizer. How ever much time you have to spend on Boca Grande, there is more to experience than time in a day, weekend or entire month! From sunrise to sunset, whether you choose to relax, exercise, shop or dine; the opportunities are endless. Of course you are welcome to contact us for ideas or recommendations on “things to do”, restaurant choices, real estate insight or advice on fishing guides. No matter your question, we’re happy to help. Contact us today.